Farrier Kingston Ontario - Are you looking for a Barefoot Trimmer? Farrier Kingston Ontario: Are you looking for a reliable barefoot farrier who is not only dedicated to keeping your horses' hooves in peak condition but also turns up on time and is easy to get hold of? Then you've come to the right place! Please note: I am no longer serving the Kingston area as I have now living in BC. As well as regular trimming for healthy hooves, I also specializing in helping horses (such as the ones pictured below) with laminitis, navicular, white line disease, underrun hooves, flares or cracks, where shoeing or other trims have failed. This horse was being trimmed by a farrier on a fairly regular basis but the trim failed to address the flaring which led to the hoof crack. This hoof crack was so bad that the two sides of the hoof moved independently of each other - the worse crack I have ever seen. With the correct trim and diligent care by the owner in applying topical medication the crack grew out extremely well. This horse had laminitis and rotation in this hoof five years ago and despite being trimmed, and latterly shod, on a regular basis there was only backwards progress. The white line disease was out of control and had literally eaten the wall away. The rotation was 20° and the coffin bone was close to penetrating. With just two de-rotating trims and diligent treatment of the white line disease, the horse is much more comfortable and new healthy wall is starting to grow in. 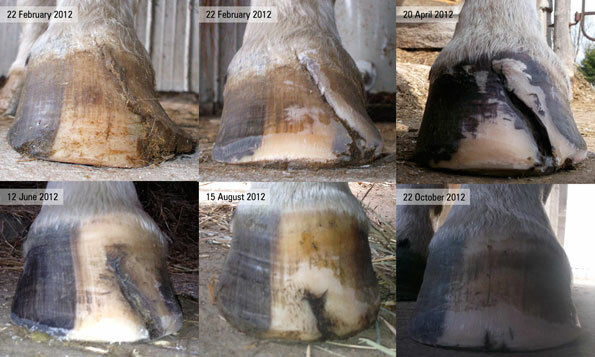 It will take another 7 months to grow an entirely new hoof capsule but progress so far is very promising. This horse also had laminitis with 18° rotation due to mechanical stress from the extremely long toe. Again she was receiving regular farrier trims but the breakover was not being addressed. The toe developed a crack, so the farrier put a shoe on to try and hold things together. 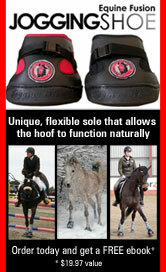 By properly addressing the breakover the crack was dealt with in just two trims and a healthy hoof could grow in. Initial assessment of horse/pony/donkey which not only covers hoof issues but also takes a holistic approach to ways of improving the overall wellbeing of the animal. Photographs of the hooves and horse before the initial trim. Physiologically correct trim which individually addresses your horse's specific hoof issues. Photographs of the hooves after the trim. Print out of hoof photos to record the progress of the trim. 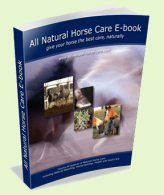 For most cases I recommend that horses in my care are trimmed on a 5-6 week schedule in the summer and up to 8 weeks in the winter. This ensures that the hooves are always kept at the optimum length which helps prevent against disease and, for recovering hooves enables the hoof to heal as quickly as possible. However for severely pathological hooves more frequent trimming may initially be needed. Trims take between 30-45 minutes per horse which includes ongoing consultation and photos. The initial set-up trim is $85 for a draft, $75 for a draft cross, $60 for a horse, $50 for a pony and $40 for a mini and then subsequent maintenance trims are $75/$65/$50/$40/$30* (*when maintained on the 5-6 week schedule). Not sure how healthy your horse's hooves are? Or not in the Kingston Ontario area? 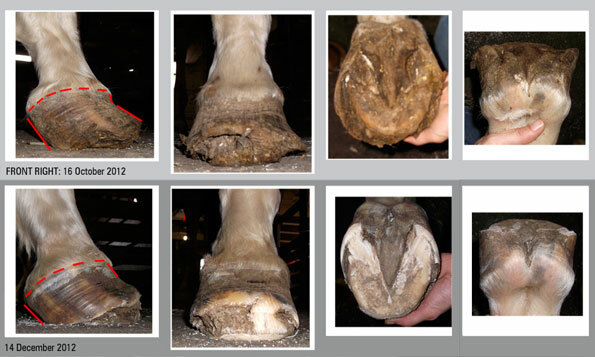 Then why not get a second opinion of your horse's current hoof condition via our photo consultation service. Click here for more information. Trimming Clinics - Want to learn to do a maintenance trim? I also run clinics to teach people how to recognize and maintain healthy hooves and how to do maintenance trims themselves. See our Trimming Clinic page for more details.